Horse camera is moved so that entire horse is full view. Now you can enjoy a better view of everything. CD Projekt RED for an amazing game, Gopher for the #1 modding website. I did not like the default view the game came with, so I made this small mod. Always enjoy the trophy you're sporting, why hide it? Better camera angles, see more. Navigate terrain, cities, tight areas, and through NPCs easier. Shows entire horse and the camera stays the same for all speeds. In my opinion it just looks better over default. 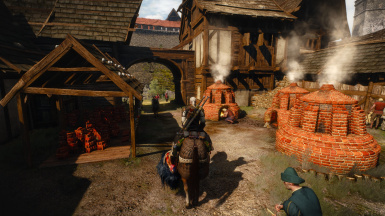 Install using the Nexus Mod Manager OR unpack to ...\The Witcher 3 Wild Hunt\Mods folder. If you do not have a mods folder, right click and make a folder. Rename the new folder to "mods"
If you have not used the Nexus Mod Manager before then you are missing out. It makes installing, removing and keeping track of which mods you have really easy. You can deactivate mods with out deleting them which makes checking for conflicts easier. Or of you want to try different versions of a mod, you can with out deleting them. It will alert you when a mod has been updated. It supports a lot of games. USE IT! NOTE: Mod is NOT compatible with auto apply oils mod. Script merger may work with the 2 mods which you can get here http://www.nexusmods.com/witcher3/mods/484/?tab=3&navtag=http%3A%2F%2Fwww.nexusmods.com%2Fwitcher3%2Fajax%2Fmodimages%2F%3Fuser%3D0%26id%3D484%26gid%3D952. NOTE: If for some reason script merger does not resolve the conflict between my mod and the auto apply oil mods, you can open the oils mod folder and delete the horseRiding.ws from it. The only drawback is that oils will not auto apply when on horse back. Oils will still auto apply while on foot.